Coach, referee and promoter Julan Brown, center with Arthur Corion, left and Travis Jack following their bout. 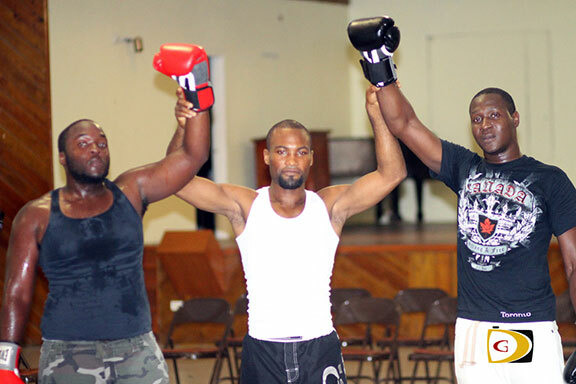 More than six years in the making after the U.S. Virgin Islands Boxing Federation helped spurred the passion, Saturday Night Fights kicked off a Boxing series in the BVI at the East End Long Look Community Center. Male and female fighters who were part of the MMA fight card put on the gloves on Saturday night for the series that actually began a week earlier with two nine year olds kicking off the action. Teia Hudley Edwards who fought Gretchen Williams in the female bout climbed back into the ring for the first time since the MMA bout. Edwards Williams said is a great fighter though she has not been training and it will be interesting to see her in a few weeks after training. Williams said the Saturday night fights is a great opportunity for people to try the sport, those who want to spectators, adding that it’s also great for fitness and builds confidence and its an amazing sport. Coach and referee Julan Brown who spearheads the Iron Fists Boxing Gym and is the promoter of Saturday Night Fights says its an opportunity for anyone to get involved in the sport. Brown said one father has inquired about his 2-year old taking lessons. He said the program currently has participants from six years upwards. Heavy weight Travis Jack had been focusing on MMA training and took a break after his coach became ill and was unaware of the boxing. He and Arthur Corion mixed it up. Saturday night fights series continues at 8 p.m. on Saturday at the East End Long Look Community Center.